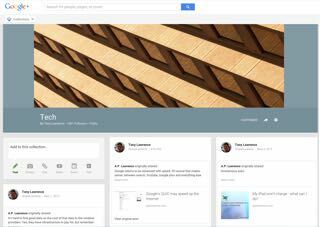 Google Plus has recently added "Collections", which is a way to categorize your posts under a title you create. For example, I created "Tech", "Religion" and "Politics" and added appropriate posts to each. Apparently people can follow your collections without following the rest of your drivel. That's sure to make many happy faces in G+ land. You cannot put a post into multiple collections. That's either a plus or a minus: I'm sure some would use that intelligently and others would not. For the things I post, the line is usually bright and shiny, so I probably wouldn't want to be mixing much, if anything. Right now, the interface seems a bit erratic to me. Sometimes it requires several clicks to get something to go to a collection. I assume that will smooth out over time.